The coat of arms of the former Duchy of Brittany, blazoned "Ermine"
Ermine (/ˈɜːrmɪn/) in heraldry is a "fur", a type of tincture, consisting of a white background with a pattern of black shapes representing the winter coat of the stoat (a species of weasel with white fur and a black-tipped tail). The linings of medieval coronation cloaks and some other garments, usually reserved for use by high-ranking peers and royalty, were made by sewing many ermine furs together to produce a luxurious white fur with patterns of hanging black-tipped tails. Due largely to the association of the ermine fur with the linings of coronation cloaks, crowns and peerage caps, the heraldic tincture of ermine was usually reserved to similar applications in heraldry (i.e., the linings of crowns and chapeaux and of the royal canopy). A stoat in winter fur. 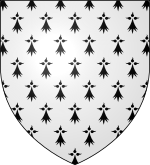 The ermine spot, the conventional heraldic representation of the tail has had a wide variety of shapes over the centuries; its most usual representation has three tufts at the end (bottom), converges to a point at the root (top), and is attached by three studs. When "ermine" is specified as the tincture of the field (or occasionally of a charge), the spots are part of the tincture itself, rather than a semé or pattern of charges. The ermine spot (so specified), however, may also be used singly as a mobile charge, or as a mark of distinction signifying the absence of a blood relationship. On a bend ermine, the tails follow the line of the bend. In the arms of William John Uncles, the field ermine is cut into bendlike strips by the three bendlets azure, so the ermine tails are (unusually) depicted bendwise. Though ermine and vair were the two furs used in early armory, other variations of these developed later. Both in continental heraldry and British, the fur pattern was used in varying colors as a blazon atop other tinctures, e.g. "d'Or, semé d'hermines de sable" for black ermine spots on a gold field. 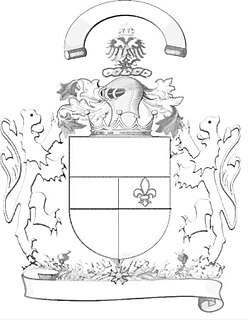 British heraldry created three names for specific variants, rather than blazoning them longhand. 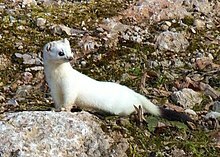 Ermines is the reverse of ermine – a field sable semé of ermine-spots argent. It is sometimes called counter-ermine (cf. French contre-hermine and German Gegenhermelin). Erminois is ermine with a field Or instead of argent, and pean is the reverse of erminois (i.e. Or spots on a field sable). Erminites is alleged to be the "same as ermine, except that the two lateral hairs of each spot are red." James Parker mentions it, as does Pimbley, though by the former's admission this is of doubtful existence. Arthur Charles Fox-Davies describes it as a "silly [invention] of former heraldic writers, not of former heralds." ^ Woodcock, Thomas; Robinson, John Martin (1988). The Oxford Guide to Heraldry. Oxford: Oxford University Press. pp. 88–89. ISBN 0-19-211658-4. ^ a b c Fox-Davies, Arthur Charles; Johnston, Graham (2004) . A Complete Guide to Heraldry. Kessinger Publishing. pp. 77–78. ISBN 1-4179-0630-8. ^ "Pimbley's Dictionary of Heraldry". Archived from the original on 2009-03-21. Retrieved 2007-08-13. ^ James Parker. "A GLOSSARY OF TERMS USED IN HERALDRY". Archived from the original on 2000-12-09. Retrieved 2007-08-13. ^ "Pimbley's Dictionary of Heraldry". Retrieved 2007-08-13. ^ Fox-Davies (1904), p. 49. The heads of humans and other animals are frequently occurring charges in heraldry. The blazon, or heraldic description, usually states whether an animal's head is couped, erased, or cabossed. Human heads are often described in much greater detail, though some of these are identified by name with little or no further description.